Hornby R636 Gauge 00 Double Track Level Crossing. Item in excellent condition, has never been used, box is in pristine condition. Contents sealed and in their plastic bag. Owned by my late father. Please ask if any queries. AS ABOVE AND IN FAIR CONDITION. Hornby Railways R.635 Double Track Level Crossing 00 Gauge Scale Models In original box, box has had some cosmetic damage over the years through use (tried to show as best I can in pictures), smoke free home. Triang Hornby R492 Diamond Crossing Super 4 track - OO Gauge NOT BOXED. Condition is Used. Dispatched with Royal Mail 2nd Class Large Letter. I am a model railway enthusiast, particularly Hornby Dublo. There are two lots each with 2 crossings. Photos of both lots are included. 1 x HORNBY R636 Double Level Crossing, it has Nickel Silver Rails and was made in GB. In good condition apart from a gate stop that has broken off (as shown in the last photo). This does not deter the working of the crossing and is not needed unless older style gates are fitted (hence the low asking price). Manufactured from the highest quality basswood. The timbers in this kit are pristine, giving you a blank canvas to work with. Ideal for crossings on both period and modern image layouts. Foot / barrow crossings at the end of a platform to allow passengers to get from one platform to another on a smaller halt or station. You get 2 pairs that's 4 gates enough for 1 crossing. The rule is not for sale and is only a guide as to the width. 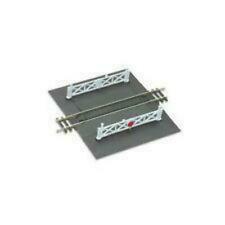 New listingOO Gauge Hornby R636 Double Track Level Crossing with gates. 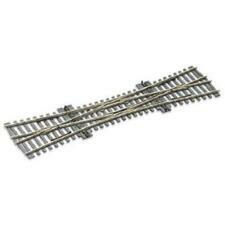 Item Hornby 00 Gauge R614 Steel Lef t Hand Diamond crossing. The odd sleeper end may be missing. UK despatch only. Goods will be well protected. 4 X RIGHT HAND DIAMOND CROSSINGS R493. NB ALL THE CROSSINGS HAVE SHORT PIECES OF WIRE SOLDERED IN PLACE AT THE ENDS. 'OO' GAUGE. 2 X LEFT HAND POINTS 1 X RIGHT HAND POINT. ALL SLEEPERS AND FISHPLATES IN PLACE. NICKEL SILVER POINT AND CROSSINGS. 2 X R615 RIGHT HAND DIAMOND CROSSINGS. 'OO' GAUGE. IN ADDITION THERE IS AN X404 POINT MOTOR - TESTED - FULL WORKING ORDER. Hornby R636 Double Track Level Crossing Kit - OO Gauge Brand new in box I do combine postage to save you money. Please feel free to ask. Please take time to view my other Track and Accessories - thanks. HORNBY 00 TRACK PACK SYSTEM C CAT NO.R8017 ALSO SYSTEM B EXCELLENT CONDITION. All in excellent condition barely used. All comes in original system c box no separate box for system b. Last photo shows complete system b and the other photos are the complete system c. All parts are there for both systems. PECO LK-50 - LEVEL CROSSING GATES x 4 PLASTIC KIT - EACH GATE 45mm LONG. Level Crossing Gate. Two pairs of gates with wicket gates for pedestrians. GLUE TOGETHER PLASTIC KIT. Add to Favourites. made with love by. These are in good condition considering their age, with no visible defects. Both points work correctly. Barrow Crossing plastic kit - allows goods. Can be usedto replicate a wooden station barrow crossing, to be wheeled between platforms. MISSING TWO SIGNALS FOR WHEN SINGLE BARRIERS USED. THIS IS IN NEW CONDITION. New listing"HORNBY DUBLO by "MECCANO Ltd."- DIECAST - LEVEL CROSSING + TRACK - 15 x 13cms. HORNBY DUBLO 00 GAUGE. "SINGLE LEVEL CROSSING". Lima Model Railway Auto Level Crossing - 00 gauge. Condition is Used. Dispatched with Royal Mail 2nd Class. These crossovers are custom built from new Peco Nickel Siver points. To see crossings in action;. code 75 and are one piece (you cannot see the join). OO gauge crossings or Walkways. I have for sale the item as per the photos. It is also boxed although the box is only fair condition due to a tear in the box. Ref number is 2460. Hornby R614. LH Diamond Crossing. 168mm x 181mm. Model Railway Track. PAIR OF PECO POINTS PLUS A GRAHAM FARISH CROSSING ALL OO GAUGE NICKLS SILVER.